Conchita is the stage name of Tom Neuwirth, born in 1988 in Gmunden, who shot to fame whilst participating in the 2006 reality show Starmania, where he ended up in second place behind future Eurovision participant Nadine Beiler. A year later he formed the boy band “Jetzt Anders” (Now Something Different). Then in 2011 the personality of Concita Wurst won the hearts of the Austrian public with her participation in the talent show “Die Große Chance”. This success led to Conchita trying her best to represent Austria at the 2012 Eurovision Song Contest in Baku. Although she narrowly missed out on winning the ticket, her song “That’s What I Am” quickly became a fan favourite, and has regularly been named by Eurovision fan clubs as one of the most popular Eurovision songs of the year. That may be the ‘official’ version – but who really is Conchita Wurst? We are told she was born in the Colombian highlands. Her mother was a famous actress, and her father was the famous theatre director Alfred Knack von Wurst. She was named after her grandmother, Conchita Barbada (“the bearded one”). She became famous in Austria through her performances on the burlesque and cabaret scenes and became the darling of the nation. 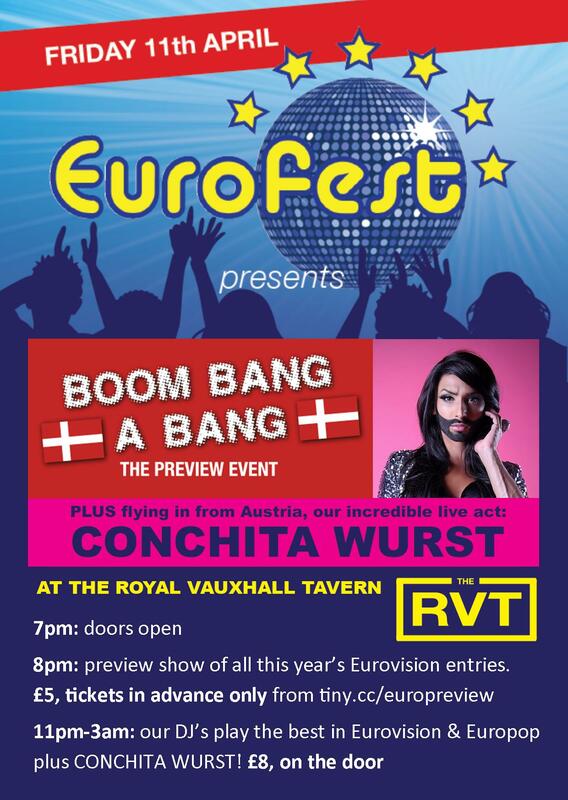 After conquering Austria, Conchita now wants to spread her voice, charm and humour across Europe! After performing at Eurofest in April 2014 she of course went on to win Eurovision in Copenhagen. We were delighted to have hosted her first ever UK performance, and indeed we would have had her performance sooner if it hadn’t been for the snow in January 2013!